Steel reinforcement forms an important part of concrete foundations. Thus, good placement of horizontal and vertical rebars in a footing is of utmost importance as placing concrete. The placement, size, cover, tying and tolerance in steel reinforcement are considered to achieve ultimate efficiency of the footing. Fig 1: Typical Isolated footing reinforcement details. Placement of reinforcement in footing requires activities such as checking for concrete cover, location, reinforcement tying and supports etc. The concrete cover is the thickness or amount of concrete placed in between the reinforcing steel and surface of the concrete member. The cover is the single most important factor in protecting reinforcing steel from corrosion. The cover is also necessary to assure that the steel bonds to the concrete well enough to develop its strength. Fig 2: Concrete Spacers used in Footing. The minimum cover for cast-in-place concrete is specified by the ACI 318 Building Code. It is a general rule that reinforcements should be placed at the tension side at the bottom of the footing. In a square footing, rebars are placed uniformly in both directions. ACI code requires that the rebars be placed not more than 18 inch apart. In a rectangular footing, rebars in the long direction are placed uniformly but not the short direction.ACI code (15.4.4.2) requires a certain portion of reinforcements in a short direction to be placed within a band equal to the width of footing in the short direction. Placing of rebars in footing has a big effect on the load carrying capacity of the footing. Any improper placement can cause serious structural failures. For example – lowering the top bars or raising the bottom bars by ½ inch more than that specified in a 6-inch-deep slab could reduce its load-carrying capacity by 20%. Reinforcement in the footing cannot be placed in the soil or hard ground as it is susceptible to corrosion. 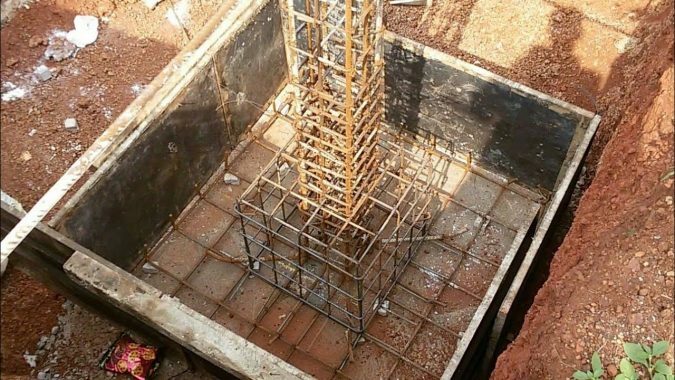 Even placing of rebars above the layer of fresh concrete and then pouring more concrete is also not acceptable as the position of the rebar may change while poring of concrete. Fig 3: Rebar Supports used in footing. Bar supports are used to hold the reinforcing bars in place to attain the proper depth of cover. 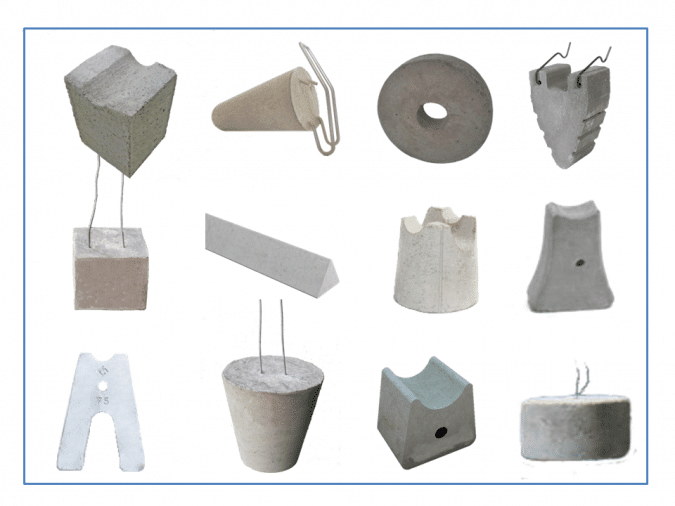 For proper placing, rebar supports are used which comes in many sizes and of different materials such as steel wire, precast concrete, or plastic. 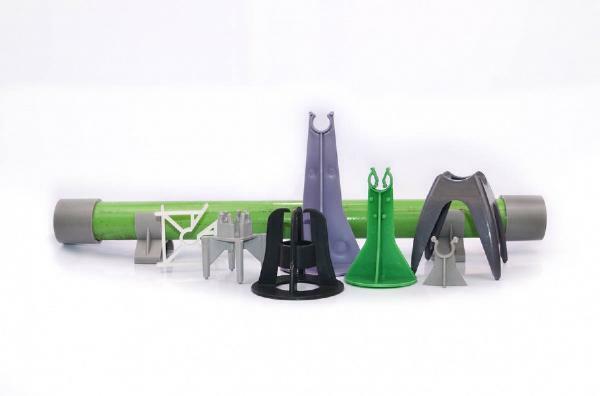 Chairs and supports are available in various heights to support specific reinforcing bar sizes and positions. Though the tie steel does not contribute to the strength of the reinforcement, it is used to secure and prevent the rebars from displacement during construction activities and concrete placement. To tie the rebars, tie wire is used which is typically 16½– or 16-gauge black, soft, annealed wire, although heavier reinforcement may require 15- or 14-gauge wire to hold the proper position of the rebar. Tying of all intersection is not needed, every fourth or fifth is normally sufficient. Care must be taken to keep the ends of tie wire are away from the surface of the concrete where they could rust. When tying bars, there is no need to tie every intersection – every fourth or fifth is normally sufficient. Be sure to keep the ends of the tie wires away from the surface of the concrete where they could rust. 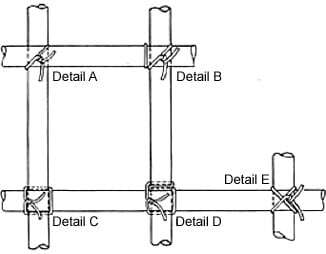 Fig 4: Rebar Tying details. Detail A: “Snap Tie” is the simplest and is usually used for rebar in a flat horizontal position. Detail B: “Wrap and Snap Tie” is normally used when tying vertical wall reinforcement to hold the bars securely into place. Detail C: “Saddle Tie” is more complicated than snap ties or wrap and snap ties. They are commonly used for securing ties to column corner bars and stirrups to beam corner bars. Detail D: “Wrap and Saddle Tie” ) is similar to the saddle tie except that the wire is wrapped 1-1/2 times around the first bar, then completed like Detail C.
Detail E: “Figure Eight Tie” can be used on walls in lieu of the saddle or wrap and snap ties. This type of tie is used to secure heavy mats. Bar supports are not intended as support for construction equipment such as concrete pumps, buggies, or laser screeds. Spacing of bar supports depends upon the size of the reinforcing bar being supported. For example, for a one-way solid slab with #5 temperature-shrinkage bars, high chairs are used at 4 feet on center; for #4 bars, high chairs would be placed 3 feet on center. Spacers for vertical concrete (wall construction) have traditionally been optional. Side form spacers include double-headed nails, precast concrete blocks (dobies), and proprietary all-plastic shapes. The ironworker, ironworker foreman, contractor, and inspector all have the responsibility to see that the reinforcing bars in concrete construction are properly placed. Deviation from specified location: In slabs and walls, other than stirrups and ties ±3 in. Stirrups: depth of beam in inches divided by 12. Ties: width of column in inches divided by 12.